Vacation rental apartment. Sleeps 6, 3 bedrooms, 1 bathroom. No pets allowed. Cozy, convenient and covered in Winter's white. Just minutes from Cannon, and approximately 20 miles from Bretton Woods and Loon. 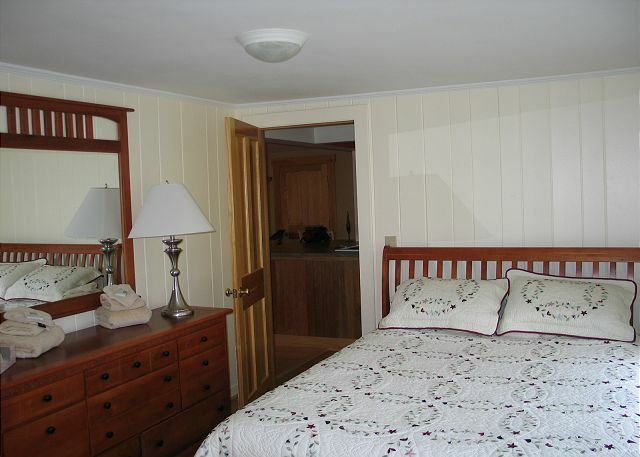 Spend your ski vacation here in the heart of the White Mountains! During warmer months your entry will be in full bloom, thanks to a very talented local flower farmer! A shot of the entire building, 3 units in all. 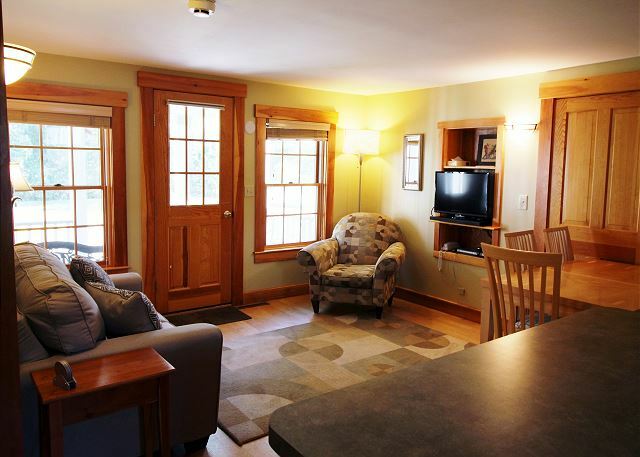 The living area with new love seat is the perfect place to settle down after a great day on a hiking trail or mountain! With an additional arm chair and ample dining table seating, there's enough room for the whole family to relax in front of the television. 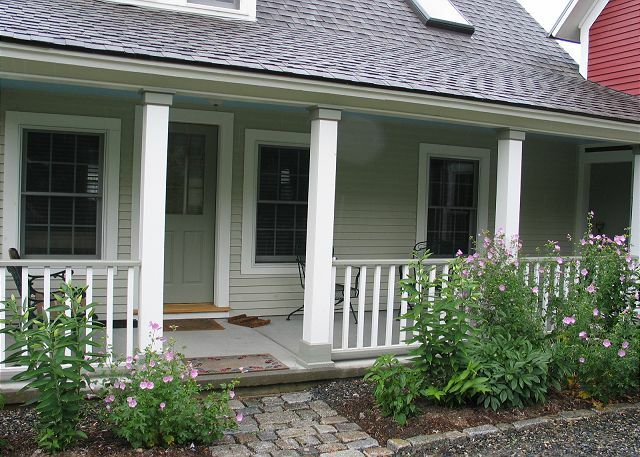 The Franconia Cottage makes a wonderful, clean and comfortable home away from home. Bedroom #1, main floor. 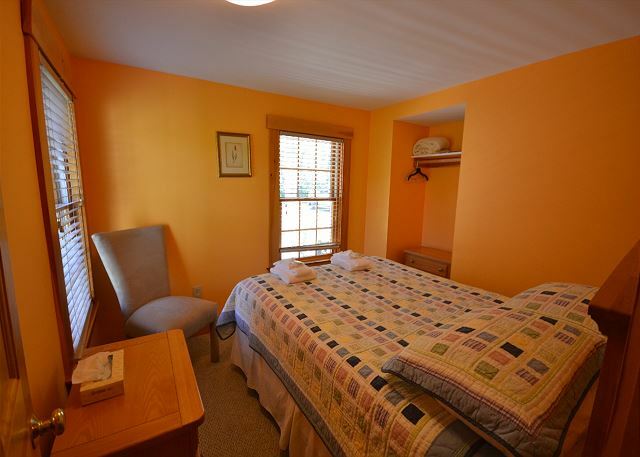 All bedding within the Franconia Cottage is by Garnet Hill; and their corporate headquarters and popular outlet store are just a stone's throw away from the rental! Folks will enjoy the light & airy design, as well as the TV/DVD that is connected to full service cable. Mornings begin in warmth and comfort here. Bedroom #2, main floor. Features a queen bed. Bedroom #3 - 2nd floor. Please note, accessed by a steeper than normal set of stairs. 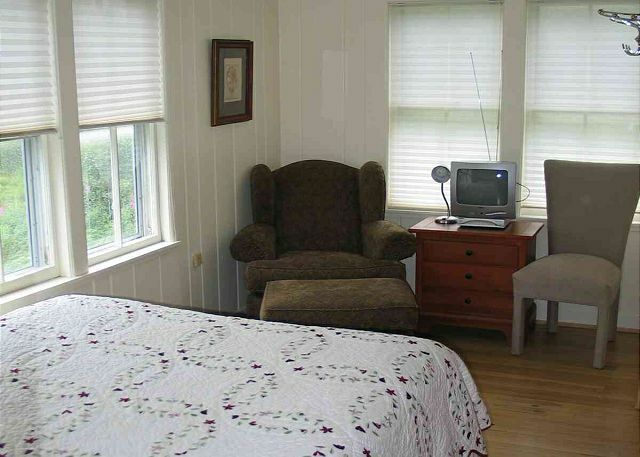 This room also features a TV/DVD, however there is no cable connection. 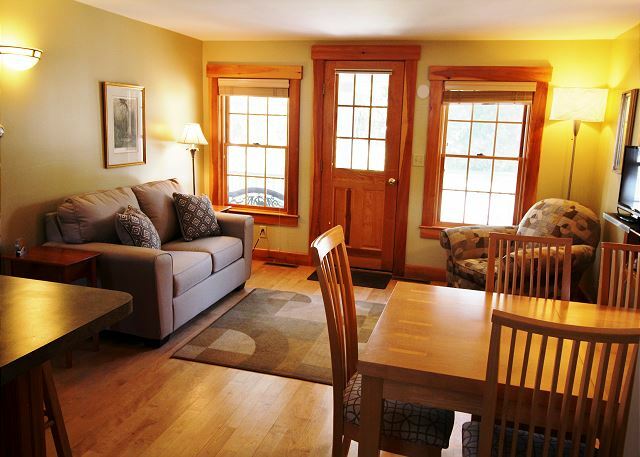 A Professionally Managed Franconia Notch Vacations Property and newly renovated, the Franconia Cottage is nicely situated within the village of Franconia. 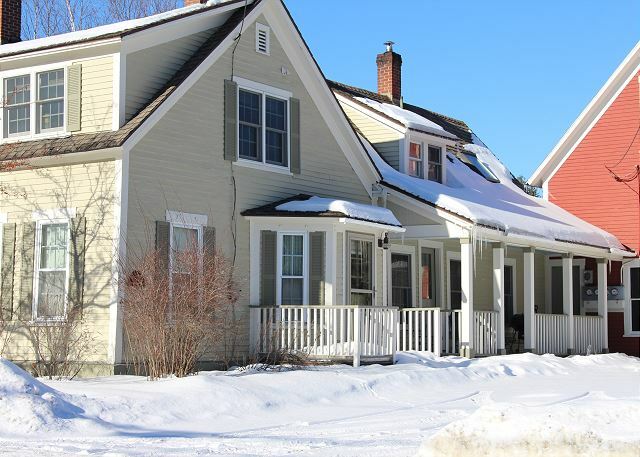 This historic three bedroom home features beautifully appointed queen beds throughout, and great appliances in the kitchen, which is immediate to the living/dining area. The flat screen TV and DVD/VCR are connected to full service cable, enabling all your favorite shows, sports, news, and of course the Local Weather. 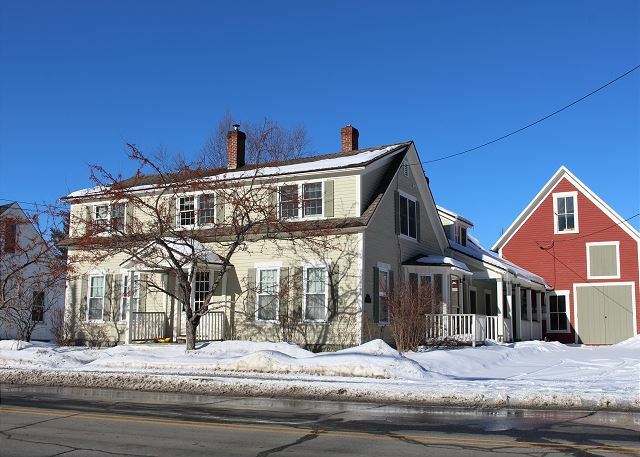 The Cottage is within an easy walk to 2 separate playgrounds, 2 historical sites, a wonderful cafe, and all the town of Franconia's shops, restaurants and grocery stores. Hop in the car, take a left out of the driveway, and 4.5 miles later you will be at Cannon Mountain Ski Area, Echo Lake Beach, and all that Franconia Notch State Park has to offer, and I-93 is under a mile. 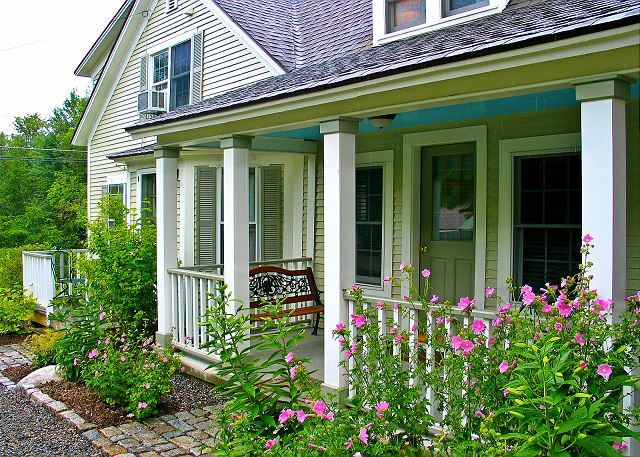 Summer and Fall season guests will be sure to enjoy the 2 available porches, as well as the wonderful perennials flowers that bloom throughout the warmer months in Franconia. The cottage is a cute three bedroom accommodation, perfect for a family, everyone got a queen size bed, small efficient kitchen and room to hang out, relax and watch tv. The cottage was very clean, nicely decorated and the management company had turned lights on and heat up for our late arrival. We prepared dinner one night and everything that was needed in the kitchen was there including garbage bags. Plenty of towels for each of us and good water pressure in the shower. Thank you for making us welcomed. Although close to 93, the noise of highway not too bad and certainly location was great to be able to walk to a terrific coffee shop and convenient food store. Arriving on a cold day in May, it was nice to arrive to a warm house, all the beds made. Nice morning light for all the bedrooms. The upstairs one accessible by steep stairway and has a skylight. We loved the location and Cort, the property manager, was very helpful. We were a bit disappointed about the lack of a full size refrigerator/ freezer and of a washer/ drier. We also would have enjoyed a better cleaned property: the window treatments, couch and chairs were stained and the bedding (quilts and shams) had not been washed prior to our arrival. To sum it up: lovely cottage, great location but could have used a more in-depth cleaning. Thank you for this feedback Ms. Isley, as with regrets to be receiving it as so. Glad to hear the vacation was still well and enjoyed while noting we will surely be "taking the White Glove" to this property here following. 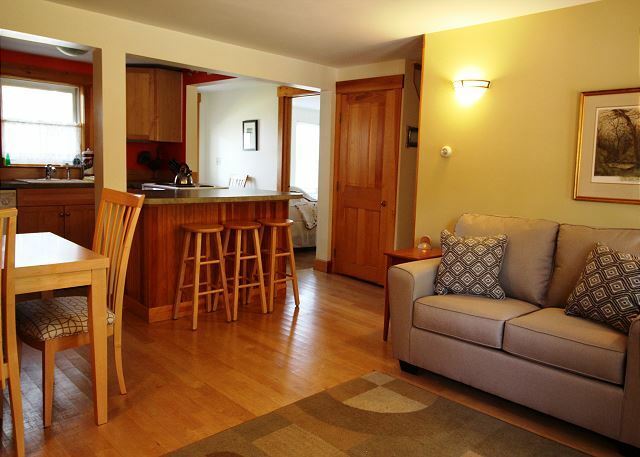 And no, this apartment style cottage does not have a washer/dryer and the refrigerator is not a full size as you say. These two will remain true. Thanks again for the honest review! We had a lovely stay at the Franconia cottage in mid August. The cottage was just the right size for myself and my 2 boys. It is located right in town close to everything including the school playground. It was clean, safe and cozy. My only negatives would be the sound of the highway and the small refrigerator (not full sized). As we are sure happy to hear that Franconia Notch Vacation was by in large a greatly enjoyed getaway, we want to that Thank You for this honest review Ms. McDonough. It was our pleasure serving yours. This property was my temporary housing while on a work assignment. I truly enjoyed my stay, the location and the view. Although I never feel 100% safe anywhere I stay, this area was safe. My only regret was that I didn't get to go sight-seeing or enjoy all the amenities in the area. Property is very well maintained. Have linen, towels, kitchen utensils..u name it u get it..enjoyed our stay and will definitely get back. Cort has been extremely helpful and spot on in responding.. Very pleased with the cottage! It was clean and modern. It had plenty of room for my wife and 2 children to spread out and enjoy our week. Easy access to all hot spots and Franconia Notch Rental staff went above and beyond for any of our needs! We will be back next year! We enjoyed our stay in this rental and found it to be a great location for our young family. Thank you! Happy Renters = Happy Owners and Agents. Thank you again for choosing Franconia Notch Vacations' Franconia Cottage for your recent visit to NH's White Mountains. A traditional American cottage decorated in a modern style. Very well kitted out with everything you'll need. 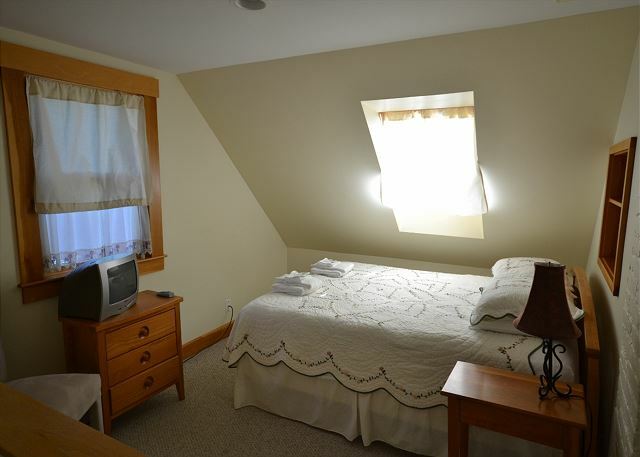 Conveniently located in Franconia near restaurants and shops, but also close to the mountains for hiking. Very helpful property managers. Will definitely be staying again! Franconia Cottage was the perfect place for our small family. We couldn't have asked for a better experience. All the essentials were well-supplied and there were even some toys and books for our toddler! We thoroughly enjoyed our stay at the Franconia Cottage. There was plenty of room for the 4 of us. Our 2 children, 8 and 3, enjoyed the park within walking distance. Despite the rain, there was plently to do as there were movies, games and puzzles already provided in the cottage. The one minus was that the cottage was not far from the highway and we could hear traffic nearby. The upside to this was that the cottage was located minutes from Lincoln and and a short drive to Polly's Pancake Parlor (a plus). We enjoyed staying in the Franconia Cottage. The cottage was a great staging location for outings to the Flume, Echo Lake, and other destinations. Trips to Littleton (tasty ice cream), Sugar Hill (White Mountain concerto performances and pancakes at Polly's) and Bethelem (fun, old-time movie theatre) were just a stone's throw away. Our toddler son enjoyed strolling over to play at the local elementary school's playground or look at the old Iron Furnace, also nearby. Thanks for the hospitality - we had a great vacation!